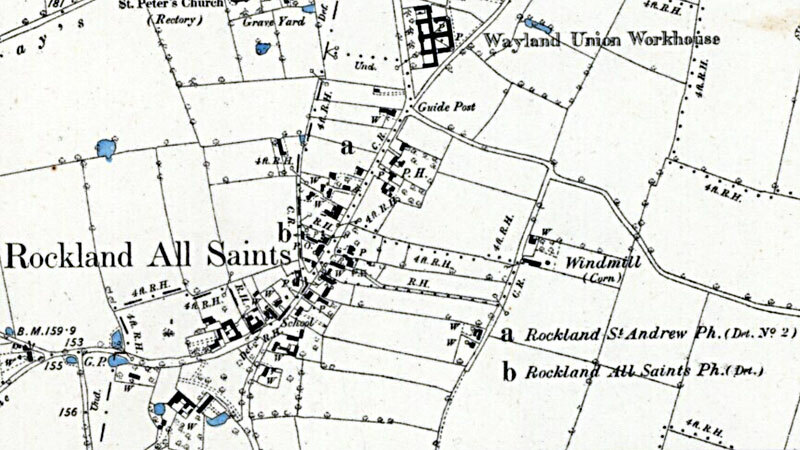 Rockland St Andrew post windmill stood in Mill Lane to the north of Rockland St Andrew and Rockland All Saints, which were combined parishes. The mill ran 2 pairs of 4ft stones and a dressing machine. An ESTATE in Rockland All Saints in the county of Norfolk consisting of an excellent dwelling house, barn, stable and other outbuildings and about 7 acres of good Land in high cultivation, now occupied by the proprietor, William Hardy. One acre of the above land is Copyhold. Also a capital newly erected WINDMILL, very advantageously situated for trade, now occupied by the said William Hardy. Possession will be given to a purchaser if required on the 1st November next. Further particulars may be had of Mr. William Cockell, Attleburgh. Notice to Debtors and Creditors of William Hardy, jun. of Rockland, Miller. An ESTATE in Rockland St. Andrew consisting of a Wind-mill, very good Dwelling house lately built with brick, stone and tiled, with a newly erected stable, and cart lodge; also a Cottage adjoining and seven Pieces of Land of excellent quality containing between 7 and 8 acres, one of which pieces is an Orchard well planted with fruit trees in full bearing. The above premises are in the occupation of Mr. Edward Kemble, who has been served notice to quit at Michaelmas next. Also 6a. 3r. of newly enclosed Land near to the rivulet which divides the parishes of Rockland and Shropham, of which immediate possession may be had. The above Estate is freehold (except one acre) and is subject only to an annual outgoing of £1. 7s. 10½d. Half of the purchase money may remain on Mortgage if required. Apply to Mr. Cockell, Solr. Attleborough. An ESTATE in Rockland near Attleborough consisting of a Windmill, a very good Dwelling house brick and tiled in excellent repair, with a new built stable and cart lodge, also a cottage adjoining and seven pieces of land of excellent quality containing between 7 and 8 acres, one of which pieces is an orchard well planted with fruit trees in full bearing. All Freehold except one acre. Possession may be had on the 11th October next. Also 6a. 3r. of newly enclosed Land on the low common of Rockland next the rivulet that divides Rockland and Shropham, of which immediate possession may be had. The Tenants have notice to quit on the 11th October next. Apply to Mr. Forster, Eaton, Norwich. A substantial Dwelling house in Rockland All Saints, in Norfolk, with granary, barn, stable, and convenient outbuildings, in good repair, together with an excellent orchard, and a piece of pasture land adjoining the same, also several inclosures of fertile arable land containing altogether about 9 acres, now in the occupation of Mr Charles Clover. Also a windmill, in full trade, standing at an easy distance from the dwelling-house, now in the occupation of the said Charles Clover. The Estate is freehold and the Land Tax is re-deemed. James & William Smith, millers & bakers, were running the mill in 1834 along with Caston_postmill, Hardingham_towermill, Hardingham_watermill, when they got into financial difficulties and were forced to assigned their personal estates and effects to their creditors. Notice is hereby given that James Smith and William Smith, of Hardingham, Rockland All Saints and Caston, in the county of Norfolk, Millers and Bakers, have by Indenture dated 25 Feb. inst. assigned all their Personal Estate and Effects to Trustees for the equal benefit of their creditors. SALTER & SIMPSON are favoured with instructions to Sell by Auction at the Griffin Inn, Attleborough, on Thursday September 28, 1876 at 5 for 6 o'c, a capital POST WINDMILL fitted with two pairs of Stones and all necessary gears, well situated for wind and doing a fair trade, together with a convenient Dwelling house, Stable, Cart lodge, Granary and Outbuildings and an Inclosure of productive Arable Land containing in all 1a. 2r. 14p. The Property is in the occupation of Mr. George Lusher and possession will be given at Michaelmas next. Further particulars of Mr. Henry Feltham. Solr. Hingham or of the Auctioneers, Attleborough. To be Sold by Private Contract A Capital FOUR SAIL WINDMILL driving Two Pairs of 4 feet Stones, fitted with Dressing Machine and all necessary gear, well situated for wind and in which for many years a good trade has been carried on, with a convenient Dwelling house containing ... and Garden, good Well of water, Stable, Cart Shed, Granary and an Inclosure of productive Arable LAND containing 1a. 2r. 14p. (more or less), situate in Mill Lane and adjoining the property of Mr. James Buckenham and Miss Tyrell. All Freehold. 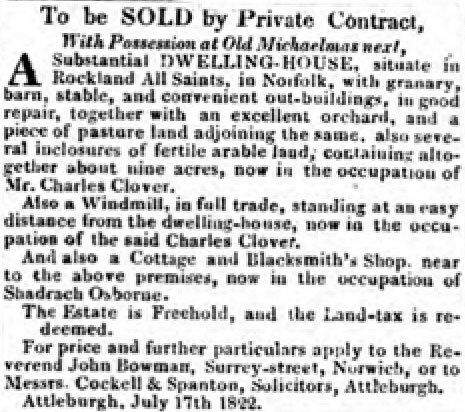 The property is occupied by Mr. George Lusher, the Proprietor and possession may be had at Michaelmas next. Apply to Mr. Henry Feltham. Solr. Hingham. SALTER & SIMPSON will Sell by Auction at the White Hart, Rockland, on Monday, February 12, 1877 at 4 o'c. The following valuable Freehold PROPERTY consisting of a capital four sail Wind Mill driving two pairs of 4 ft. Stones, fitted with Dressing Machine and all necessary gear, well situated for wind and in which for many years a good trade has been carried on. Also a convenient Clay and Tiled Dwelling House ... also a Garden, Well of Water, Stable, Cart Shed and Granary, together with an inclosure of productive Arable LAND, containing in all 1a. 2r. 14p. 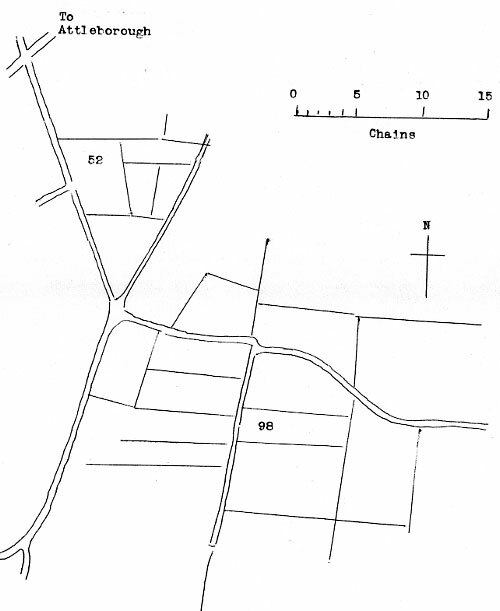 (more or less) situate in Mill Lane and adjoining the property of Mr. James Buckenham and Miss Tyrell. Land Tax 10s. Tithe Rent charge (variable) £1. 3s. 5d. The Property is occupied by Mr. George Lusher and immediate possession may be had. Further particulars of Mr. H. Feltham. Solr. Hingham or of the Auctioneer, Attleborough. Wanted, a Single Man to Live in the House. Apply to Mr. Lusher, Rockland, Attleborough. 1891-1904 and at Hingham_Deopham_Rd towermill and Hingham watermill. William's father Samuel Barber worked at Scole towermill from 1845 - 1864.